Due to the polls regarding the Brexit, USD got weakened against many other currencies. GBPUSD started today with a sharp rise followed by a small pullback. 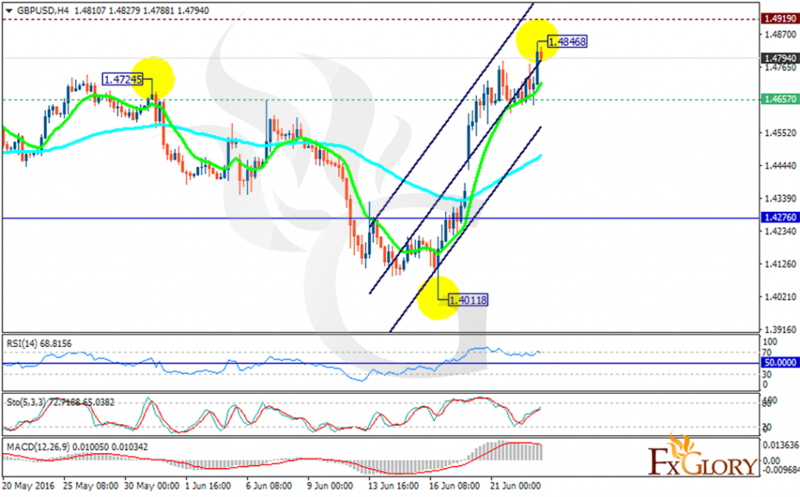 The support lies at 1.46570 with resistance at 1.49190 which both lines are above the weekly pivot point at 1.42760. The EMA of 10 has already surpassed the EMA of 75 and is climbing up the ascendant channel. All indicators are showing price growth however, the RSI is getting to the overbought area which might lead to a price fall. Anyway, the MACD indicator is in positive territory and the Stochastic is showing upward momentum. In terms of the price growth, buyers can target 1.5000 otherwise the pair falls to 1.4400.